Dan Slade is a Doctoral Student in the Planning and Environment pathway at the University of Liverpool. Dan reports here on his experiences during his Parliamentary Office of Science and Technology Fellowship. Last month I finished a 3-month ESRC funded internship as a Fellow at the Parliamentary Office of Science and Technology (POST). 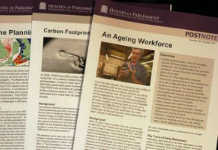 POST provides parliamentarians with balanced and rigorous research in current public policy issues. They produce short ‘POSTnotes’ on everything from the links between sugar and obesity, to marine planning and ‘big data’. My POSTnote was on ‘trends in political participation’, and is being distributed to MPs as part a welcome pack, following the 2015 election. From the placement I gained rare and fascinating access to the world of Westminster, which on its own is a wonderful thing to have. We see a caricatured version of it is on our television screens all the time, but working for POST you get to walk down the oak-panelled corridors of the Houses of Parliament, see political news unfold from the inside, and meet some people you’d never really thought you would. Walking past huge groups of Japanese tourists taking selfies, and entering the front of the Palace with a wave of your ID card, never gets tiring! My three months working at POST certainly wasn’t one of the easiest things I’ve done, but it was definitely one of the most rewarding. Apart from the odd progress report or meeting, you’re largely left to structure your time yourself. My work involved consulting around 35 experts in the field of political participation (from well-known academics to MPs, and Civil Servants), carrying out a wide-ranging literature review, and then somehow squeezing this all into less than four pages. I learned to better manage my time, correspond more effectively and above all, write more succinctly (given the four-page limit, I think it’s probably the latter I’ve improved most!) – all skills which look good on a CV. Insights I gained from my time at POST have since changed the course of my research (in fact, I’m currently drafting a paper on how Parliamentary scrutiny shapes town planning policy! ), and though my work already concerned the practice of national-level policy-making, I’m sure this would be the case for anyone with a research interest in anything from public policy, to UK politics and science policy. The experience has definitely strengthened by CV, and probably also broadened my post-PhD horizons. Overall, whether or not I choose not to go into the world of policy-making after academia, the placement has given me a deep, hands-on, insight into the world of policy work, as it occurs in practice – rather than theory. Practice and theory are often two very different things, but bridging them is something I think academics have a duty to. Beyond anything else, though, working at POST has provided me with some memories I’ll never forget. I’ve recommended applying to every fellow PhD student I’ve met since. Throw yourself in – you’ll probably love it. The competition for the next round of POST fellowships is currently open. Any ESRC-funded PhD student who will be in their second or third year in 2015/2016 (or part time equivalent) is eligible to apply. Successful applicants will receive a three month funded extension to their PhD at a rate equivalent to their current PhD maintenance stipend. The deadline for applications is 5th July. Please see the ESRC website for more information.